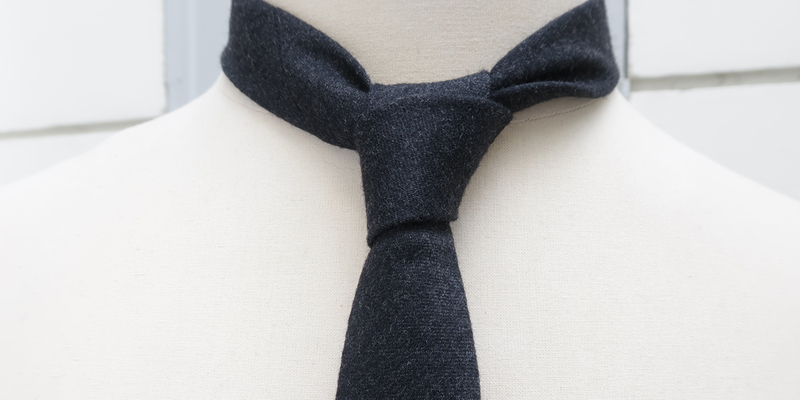 Dark Grey Handmade necktie in Wool & Cashmere woven in 1950. Tie Pointed version self-tipping or straight bottom version choice. Your tie is cut and then assembled by hand with a silk thread, in Paris by philippegaber. Philippe Gaber tries to design his ties on demand so that it is at the right length without additional charge and on simple request from philippe. The inner soul of your tie is a woolen interlining. Ultra luxury, this fabric suit reflects the French and English knowledge of the time and often woven with now extinct processes. The ultra luxury weaving is a mixture of anthracite and white forming a small micro-fancy pattern. The fabric of your tie, is a pure virgin wool signed Noblet, Drapreie prestigious disappeared 1960. Specializes in fabrics tailored in pure wool Virgin combed micro-fantasy signature of this House. A French know-how, manufactured on the Roubaix side, which has been recognized worldwide. The wool yarn used is a highly twisted yarn, which makes the fabric fairly dry to the touch but pleasant, dense weaving. Exceptional and rare this fabric Tailor is a reflection of French know-how of the time and often woven with now extinct processes. Philippe Gaber pays particular attention to the manufacturing and the elements that make up your tie. Your luxurious tie is cut in three pieces, at the 45 ° angle of the fabric, to be folded by hand like an origami, with a core (the interlining) inside, which will give your Tie its volume. The thread that gathers your tie is very important. Because it is he who keeps your tie and the most used yarn, to assemble the central seam of your tie, is strong and good quality, the more your tie will last in time, while keeping its elasticity and ensuring it robustness. At philippegaber, the thread used to assemble your tie in Paris, is a natural silk thread, 100% silk, from the Maison AUVERASOIE, founded in 1820 and a French Vivant heritage company. When hand-assembled, this luxurious silk yarn, is also perfect to keep the tie and the interlining, placed inside. The binding wire, ending the two ends of the central seam, is a Parisian Bartack. Handmade, An ultimate guarantee of quality, indicates that the central seam of your tie is assembled by hand with a single needle and silk thread which helps to keep the elasticity of your tie. Looking at a tie, you can always look at the thread and you can look at the dot density. The higher the dot density, the better! Apart from that, you just need to shoot a little. If it is a bad quality tie, the thread will break. You can also pull on both ends of the tie. If this one, spins or turns on itself, it is a bad quality tie. A tie with a thread of poor quality and more, sewn to the machine. The Self-Tipping Finish of a Handmade Tie is the fabric that is sewn to the back of the tie tip and that uses the same fabric as the tie itself. It is an ultimate guarantee of excellence of a tie. For if you pay special attention to the tip, it implies that one pays the same attention to the interlacing (the soul of the tie) which will give it its volume but also will help it to keep its shape and Its elasticity. The finish of the tip of a handmade tie is very important. A detail that counts in the choice of his tie. That is why, philippegaber offers, ties, handmade and self-tipped with a silk thread as this version, much more luxurious and serene in time, brings a balance to your tie and requires much more time in its production. All these details of your tie make that you can say "My tie, an exclusive limited edition, which was specially hand made by philippegaber for me!". This is what makes all the exception of Philippe Gaber's handmade luxury ties in Paris. The tie is something precious and fragile. In addition, it is made in noble fabrics such as pure virgin wool, wool and cashmere, wool and silk. A luxurious handmade tie does not wash in a machine. The maintenance must imperatively be done dry! The presence of needle and thread, fixed by a hand stitch on a sample of the fabric of the tie is simply to allow you to do an ironing test with or without steam, but also a test for maintenance and see The reaction of the tissue. - To ensure a long life to your favorite tie, it is therefore recommended to lend it, the greatest attention. - If your tie is crumpled, you can iron it I advise you to use a piece of cotton to put on your tie to iron it thus avoiding gloss. Do not use too much steam, you may distort the tie, pass lightly and do not press too hard, you risk losing the rounded edges and end up with a too flat tie. - Keep your tie away from light and sunlight when you are not wearing it to prevent your tie from becoming discolored. It is also recommended to hang it on a loose tie holder, it can also be wrapped or stored flat. Always undress completely and carefully. Indeed, if you leave too long a tie with the knot made, it risks to mark the fabric. Obviously, the best is still not to wrinkle it and for this there is a trick: the knot must be light to avoid wrinkles.